The Water Development and Management Plan (SAGE) is a planning tool, laid down by the Water Act of 1992, which aims at balanced and sustainable water resources management. This is a local variation of the Master Plan for Water Development and Management (SDAGE), which sets out the fundamental orientations of water policy in major French river basins. The SAGE sets, coordinates and prioritizes general objectives for the use and protection of water resources, taking into account the specificities of the territory. It sets priorities for actions, identifies the resources needed, and lays down rules for the sharing of uses. While being based on a voluntary approach, it has become a privileged tool for responding locally to the objectives of the Water Framework Directive (WFD), especially the objective of good status of water bodies. An environment contract (usually a river contract, but also a lake, a bay or a groundwater contract) is a voluntary action plan, with the financial commitment of the partners concerned for a comprehensive, concerted and sustainable management in a consistent river basin unit. 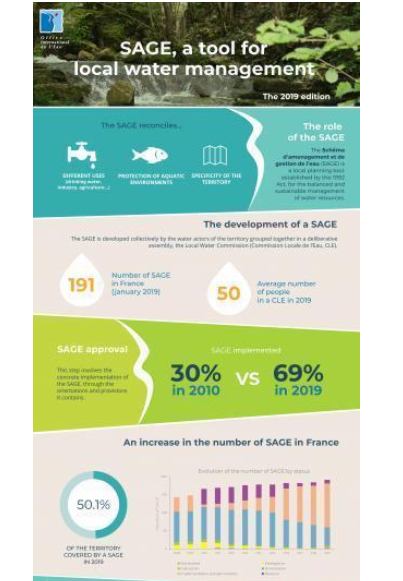 With the SAGE, the environment contract is a relevant tool for the implementation of the SDAGEs, taking into accounts the objectives and provisions of the WFD. It may be an operational variation of a SAGE. The SAGE mobilizes the water and area stakeholders, regrouped in a Local Water Commission (Commission locale de l’eau - CLE). It is a parliament where all the stakeholders are free to speak and express their points of view, thus allowing for a real dialogue, the achievement of works in the areas and the application of common rules. The CLE is composed of three colleges: the State, the users and the local authorities, allowing for a good representativeness of the area. The supporting structure (grouping of communities, interdepartmental institution, mixed syndicate, etc.) provides the secretariat and facilitation of the CLE. It is the owner of any studies and work to be carried out. Finally, the State services accompany and supervise the development and implementation of the SAGE while the Water Agencies finance and provide technical and methodological support to the SAGE facilitators. Environment contracts are signed by the partners involved: prefect(s) of department(s), water agency and local authorities (general council, regional council, municipalities, intermunicipal syndicates, etc.). A river (or bay) committee is established by prefectural order to control the drafting of the contract that it facilitates and that it follows up. As with the SAGE, a support structure is responsible for facilitating the contract execution. In order to promote the balanced and sustainable management of water resources and aquatic environments and to federate stakeholders, IOWater is responsible for facilitating the network of the stakeholders of SAGEs and environment contracts. The objective: to meet the needs of local stakeholders, taking into account the national priorities of water policy, its links with biodiversity policy, the Flood Directive, its integration in land use planning and economic development policies, as well as in the territorial reform. Since 2002, IOWater has been facilitating the network of stakeholders in local water management, especially through Gest'eau (www.gesteau.fr), by pooling and disseminating knowledge, gathering, sharing and enhancing experiments, accompanying the stakeholders and facilitating the capacity building of the facilitators.